Resort Dining | Go Resorting! Ontario’s woods are ablaze in fiery shades throughout October. At the same time as forests are being transformed into a painter’s palette of colour, harvest season is in full swing. It makes for an ideal season to escape and unwind at one of the province’s resorts; wander along country lanes lined with maples turned cherry red, harvest apples by the bushel in orchards strewn with copper-coloured leaves, or simply curl up by a crackling fire-pit to inhale the scent of autumn. October is all about experiencing the natural bounty of Ontario’s magical autumn season. Perhaps in no place does the bounty of the season—brilliantly-coloured leaves and flavorful crops—come together more perfectly than in Muskoka, home to some of the best leaf-peeping in the province and as well as to our most distinctive autumn crop, the crimson cranberry floating languidly in their flooded fields. “The biggest misconception about cranberries—and there are many—is that they are an aquatic plant. They actually grow in boggy fields. It was discovered that ripe cranberries float in water, and so it became common practice for farmers to flood fields in the autumn to facilitate harvesting,” explains Wendy, one of many fascinating facts you discover during the daily bog-to-bottle tours of the farm (recently named a Signature Canadian Experience). During October you can watch as berries are harvested from the flooded fields, enjoy wagon rides of the bucolic property, wade in amongst the berries for a priceless photograph, and sample a number of delicious cranberry wines in the Cranberry Café. An autumn day at Johnston’s Cranberry Marsh is a truly memorable experience. A warming postscript to cranberry cravings and arboreal amblings can be found at a number of nearby resorts, including Sherwood Inn (www.sherwoodinn.ca), a cosy yet elegant hotel on Lake Joseph just a short drive east. When you arrive at Sherwood Inn, you slip into a slower pace of life. You can’t help yourself. True, the property boasts the amenities required of a modern resort—a comfortable spa with staff as soothing as the treatments themselves, a fine dining restaurant with world-class food that manages to be both sophisticated and hearty at the same time—but in general pleasures are simple. When Charles Draper built the inn in 1939, his vision was of a property more akin to a cottage than a hotel, where personal service and a sense of intimacy would be the main drawing cards. Much has remained the same in the 75-years since. The main lodge is still nestled snuggly among century-old pines. A calming tranquility still prevails. And the tradition of excellence in hospitality that has been a part of Sherwood Inn’s history remains very much alive. Sherwood Inn is also famed for its fine dining. Executive Chef Everett Bell was born and raised on Lake Huron’s North Shore, and brings distinctive cottage country flavors to the menu. When days shorten and temperatures drop, Bell likes to introduce fresh cranberries into his menu as a nod to the season. “My grandparents had a farm on the North Shore, so I gained an appreciation for fresh, local food. The only experience most people have with cranberries is canned cranberry sauce, but these tart berries can be used for so much more (see recipes below),” Bell explains. Nature’s bounty, in the form of spectacularly colourful scenery and farm-fresh food, makes October a truly unique season. Make the most of this fleeting season with days spent escaping and unwinding at one of Ontario’s resorts. Sherwood Inn isn’t the only resort from which to base a weekend spent indulging in cranberries and marveling at brightly-coloured landscapes. Also nearby Johnston’s Cranberry Marsh are Rocky Crest Resort, Shamrock Lodge, Windermere House, Trillium Resort and Spa, Grand Tappattoo Resort, and JW Marriott, the Rosseau. And of course, cranberries aren’t the only crops being harvested this time of year. Apples, corn, garlic, pears, pumpkins, squash, and a host of others are available at market stands and pick-your-own farms across the province (to find them, go to http://www.HarvestOntario.com) Wherever you vacation in Ontario, whichever resort calls out to you, there are certain to be an open-to-the-public farm nearby. Andrew Hind is a freelance writer specializing in travel and history. He is the author of 19 books, including Muskoka Resorts: Then and Now and most recently Patterson-Kaye: A Celebration. He can be reached at maelstrom@sympatico or followed on Twitter @discoveriesAM. Add the cranberry juice, vinegar, honey, and whole cranberries together in a medium size pot. Reduce for 20-30 minutes over low heat, or until the whole cranberries begin to break down. In a medium size mixing bowl, combine the Dijon and cranberry reduction. Whisk briskly, slowly dripping the olive oil in until the desired consistency is reached. Serve with your favourite salad! Cube the bread. Combine all ingredients, and mix until a rich thick consistency is formed. Bake at 325 F for approximately 20 minutes or until the chocolate just starts to ooze out and the bread is turning golden. Combine all ingredients in a medium sized saucepot, and bring to a simmer over medium heat. Reduce heat to low, and gently simmer, until the apples and cranberries start to break down, and form into chutney. Taste, and add honey or sugar as desired. The warming days of April bring with them maple syrup season, an annual tradition in rural Canada and a favourite for family eager to experience a taste of spring. There’s no place better to experience the bounty of the liquid gold than JW Marriott The Rosseau Muskoka Resort, where the resort’s talented chefs have crafted a maple inspired menu to tempt your taste buds. Maple syrup isn’t just for drizzling over pancakes and waffles. Executive Chef Shaun Crymble is excited about the new menu and how it reflects the season. Begin your dinner with steaming bowl of maple-roasted butternut squash soup, made with pumpkin seeds, sage and maple-infused cream, and maple bacon lardons. It’s so good you’ll be scraping the bottom of your bowl for every last mouthful. For a main, savor the maple-glazed pheasant breast, served with braised red cabbage, apple and onion soubise, and drizzled with a mouth-watering red wine maple syrup reduction. Perhaps the best was saved for last, the sinfully good maple syrup sugar pie. Put aside your diet for this one evening and enjoy. Pull yourself away from the table long enough to experience the process behind the maple sugaring process as performed by Muskoka’s settlers. Tap, collect, boil, and taste during onsite demonstrations every Thursday and Sunday from 1-4pm starting March 20th. With gorgeous views of Lake Rosseau, an indoor-outdoor heated pool, and soul-soothing spa, it’s easy to get lulled into a sense of tranquillity at The Rosseau. But if you can pull yourself away from the comforts for just a few hours, you may perhaps want to tour Sugarbush Hill Maple Farm in Huntsville, or any one of the other area sugar bushes taking part in the first annual Muskoka Maple Trail (www.discovermuskoka.ca/muskoka-maple-festival.html), to appreciate how a commercial maple farm operates. Maple sap runs for only a brief window, and so too does the maple menu at JW Marriott The Rosseau Muskoka Resort. Visit before April 24 to savour the bounty of the springtime Muskoka woods. Resorts in Ontario offer an incredible range of experiences for all season, and many member properties have integrated the sweet taste of maple into their menus. For more information, go to www.resortsofontario.com. Whisk together brown sugar and eggs until creamy. Add cream, syrup, and butter, then whisk until smooth. Pour filling into pie shell. Bake pie in lower third of oven until pastry is golden and filling is puffed and looks dry but still trembles, 50 to 60 minutes. Cool on a rack to room temperature (filling will set as pie cools). Pass the orange juice through a sieve into a small pan with half of the caster sugar and rosemary and simmer until reduced by half. Remove from the heat and allow to cool completely, then remove the rosemary sprigs and discard. Fold into the crème fraiche, then cover and chill until needed. Combine all ingredients in heavy medium saucepan. Stir over medium-high heat until sugar dissolves and mixture comes to boil. Reduce heat to medium and simmer until berries pop, about 4 minutes. Cover and chill. Rewarm over medium heat before serving. Andrew Hind is a freelance writer specializing in travel and history. He is the author of 19 books, including Muskoka Resorts: Then and Now. He can be reached at maelstrom@sympatico or followed on Twitter @discoveriesAM. As Ontario’s Local Food Ambassador I’ve travelled the province uncovering its hidden treasures from amazing resorts to charming country villages and mouthwatering food festivals. In between I have savoured toasted garlic fudge a the Perth Garlic Festival, enjoyed a romantic field dinner at Cross Wind Farms and chowed down on the sloppiest, juiciest ribs at the Ottawa Farmers’ Market – oh yum. I discovered Ontario’s most delicious food in the most unlikely places. Travel through Hensall, the bean capital for amazing cassoulet, Perth County the pork capital and home of the Bacon and Ale Trail or the dairy capital, Oxford County and savour your way through the Cheese Trail. I also discovered many resorts that excel at making Ontario food a focus for what they do best. In Oxford County, Elm Hurst Inn’s executive chef Michael Davies takes his cheese very seriously. I used this historic inn as a base to visit as many stops along the Cheese Trail as I could. At the inn, try Michael’s all-local cheese platter or enjoy one of his cheesy features such as the delicious cheddar soup. What a great time you’ll have! Blue Mountain Resort is the centre of Ontario’s apple production and also home to the Apple Pie Trail. The Blue Mountain Resort in Collingwood is at the beginning of the Trail and is a great place to take advantage of everything apple pie from the different stops along the way. Then when you’ve over indulged (as I did), have fun working it off with many of their 4-season outdoor activities, it’s great for the whole family. When you leave, don’t forget to buy a bushel of farm fresh apples to continue your apple love affair. One of my favourite culinary destinations, the Millcroft Inn & Spa was once a knitting mill providing yarn and blanket. Executive Chef James Buder crafts delicious dishes from fresh, organic and natural foods that are available to him throughout the fertile and unspoiled Hills of Headwaters. Bring a good pair of hiking boots because the tranquility of this place along with Buder’s cuisine will captivate you. The Hills of Headwaters, or Headwaters as the locals call it, is quintessential Ontario equestrian country with rambling ranches and graceful horses. It’s also a delicious rural landscape with farmers the likes of Amaranth Springs, Besley Farms and Hockley Valley Resort growing amazing food. 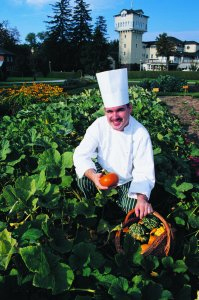 At Hockley Valley they have a 4-acre vegetable garden providing over 80% of the vegetables for Restaurant 85 and Cabin. Some of it is preserved to enjoy year round. What a refreshing experience to bask in the authentic flavours of the summer when you’re dining in January or February. You’ll find more gardens at Briars Resort and Spa. Executive Chef Trevor Ledlie plans his menus a year in advance. It’s a great culinary collaboration between Inn owners and a chef who knows it takes as much time to nurture a tiny seedling into a fully mature plant as it does to simmer the ingredients into a luscious meal for his guests in the Briars’ dining rooms. Foods this fresh are thrilling on the palate. When I was at the Westwind Inn I remember sitting in a large Adirondack chair watching a herd of deer pass through the forest. The Inn is as peaceful and remote a place as any in the heart of Ontario. The owners forage the wilderness around them for wild fiddleheads, leeks, morel mushrooms, edible flowers and more. You can try asking for their favourite picking spots but it’s like asking a fisherman for his favourite fishing hole – they’ll never tell. I’m told it I sat in the chair long enough, I might catch a glimpse of a flock of wild turkey, or perhaps even a moose. At Westwind you are allowed to shoot them, but only with a camera! Ontario provides such a stunning array of varied landscapes that lends itself perfectly to those seeking a romantic getaway. Regardless of the season, there is a charm when visiting Ontario Resorts that is unmatchable. Scattered throughout the province these hidden treasures provide serenity and a mysticism that will help your love blossom. Resorts of Ontario offers 100 unique resort hotels, lodges, cottages and inns, each with their own unique qualities. From sunrise to sunset, our goal is to make every moment of your stay worth sharing with your loved one to create lasting memories and romance that will carry on past your vacation. Our resorts are the ideal location for a picture perfect wedding. Imagine saying your vows surrounded by lush and beautiful forests or overlooking a calm lake. Your guests will love sharing in the scenic ceremony and reception as much as you. They will thank you for providing them the perfect reason for their own romantic escapes. When you stay at an Ontario Resort, you control the days events. So whether you’re the type that wants to go for a morning stroll with coffee in hand to watch the sunrise across the lake or if you prefer to sleep in and have breakfast in bed; we work with you to make sure your day starts off right. After any vacation, people always talk about the food. Our resorts recognize the importance of providing exceptional meals. It’s not often that people can feel pampered when dining but that is what you can expect from these culinary teams. Each course is prepared to the highest quality. The aromas from the kitchen will cause your mouth to water. The visual presentation is a photographic delight and the flavours are to die for. What could be more romantic than treating yourselves to a couples massage, letting your muscles loosen while soaking in a hot tub and detoxifying in the sauna. Of course that is just a taste of the treatments and relaxing experiences available through our resort spas and you can add to and customize your relaxation with things like a mud wrap, facial, manicures and pedicures. As your day winds down, pour yourself a glass of wine and enjoy the silence of the surrounding nature in each others arms. One those cooler nights, a crackling fire adds to the perfect ambiance of your romantic getaway. Next time the two of you need to getaway, come on up to our place and visit www.resortsofontario.com to find your perfect romantic retreat. Resorts of Ontario is pleased to announce that 3 of our current resort members have been selected as readers choice winners through the Toronto Sun. 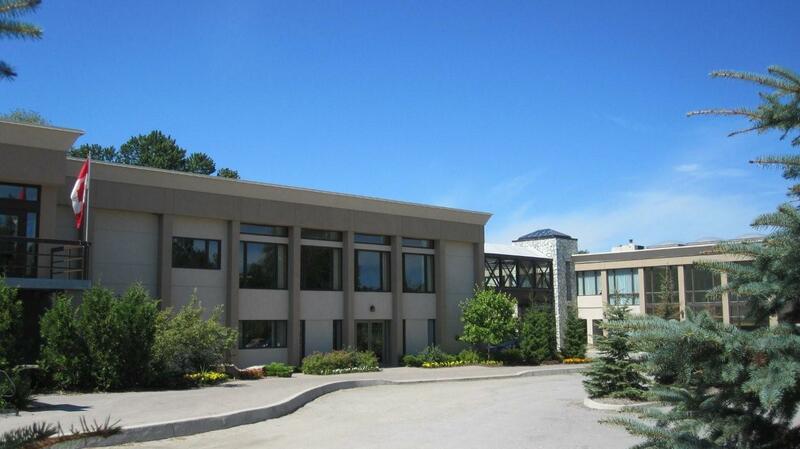 Nottawasaga Resort in Alliston Ontario won the top honour with the Gold award for favourite Ontario resort. Silver went to Great Wolf Lodge in Niagara falls and the bronze went to Blue Mountain Resort near Collingwood. Nottawasaga Resort also secured the gold award in the category of favourite recreational hockey arena and bronze for restaurant with a view. It’s no surprise to us that some of our resorts took this honour but if you aren’t familiar with the terrific resorting experiences Ontario has to offer, we encourage you to come on up to our place for your next getaway. With activities like a year round indoor hockey rink at Nottawasaga, fantastic activities like skiing and the new Ridge Runner roller coaster at Blue Mountain and the ever fun water park at Great Wolf Lodge; you’ll leave with new memories as a reminder of the fun you can have when you visit an Ontario Resort. Relaxing and comfortable accommodations with options for solo travelers or large family groups. 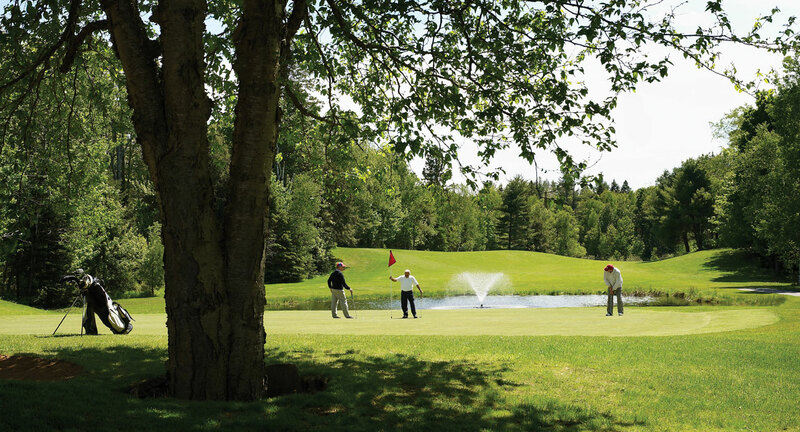 Fantastic Golf: Pinestone Resort is offering a fantastic special of 2 for 1 golf on Tuesdays. This is a great opportunity to challenge your game on their par 71, 6,204 yard course designed by Jack Davidson. Full conference facilities. With 10 meeting rooms, they can easily accommodate groups from 10 – 250 people making it a great place for you to hold your next wedding or conference. Dining at Heatherwood Restaurant. This beautiful restaurant was designed with true north decor and provides fantastic views of stunning sunsets. Heatherwood Restaurant a very sought after restaurant in Haliburton so be sure to make a reservation. And now they add the new spa with an assortment of treatments that will leave any guest feeling completely rejuvenated. Of course, if you are going to Haliburton, the town is beautiful, it is a short drive to Algonquin Park, and there are many beautiful lakes in the area. Haliburton is also a terrific spot to see the fall colour change in all it’s glory.